At the start of the decade, Audio Research announced a strictly limited two-box line preamplifier to celebrate 40 years of the brand. The Reference Anniversary model was only available during 2010, but it became the cornerstone of a lot of subsequent technologies introduced by Audio Research. 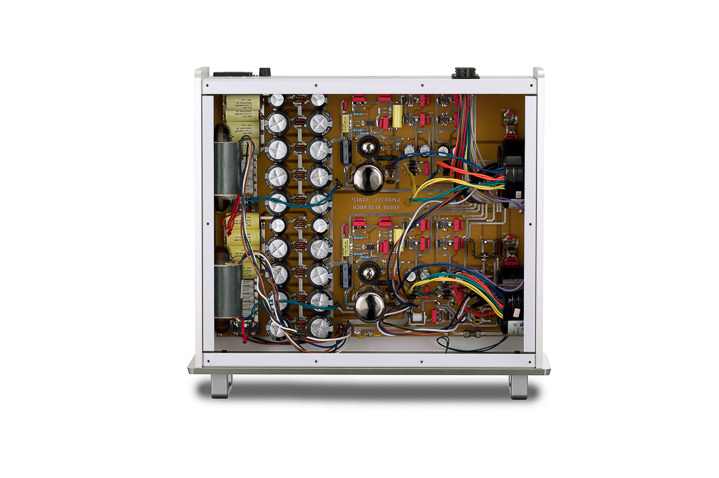 However, in making those subsequent preamplifiers, Audio Research has learned a lot, and that has filtered back into the Reference 10 line preamplifier. The Reference 10 models – a matching two-box phono stage is also available – stand apart from the rest of the range. They are effectively beyond the flagship of the Audio Research range and move into a new realm; the mainframe preamplifier. In fact, it’s not a new idea for Audio Research at all, it’s just been lying dormant for a while. Traditionally, the company built its flagship designs in twin chassis – most notably the classic SP10 from the 1980s – but even in that vaunted company, the Reference 10 is big. Power-amp dwarfing big. One of the two large chassis houses the source connections, display, and logic circuitry; the other is the power supply. They are connected by thick Burndy multi-pin cables of the type used by Naim Audio for its top-end devices. These are thick, inflexible, and designed to carry power from device to device with the maximum amount of internal screening, so there is no possibilty of one power supply feed interacting with the others. That control box is comprehensively supplied, with seven line inputs (technically six and a processor), all running XLR balanced or RCA single-ended. There are three similarly specified outputs, one of which is also destined for processor use. The Reference 10 is also heavily logic controlled, from the timed 40-second standby in power-up to the assignable input names on the large green front panel touch display, everything is driven by the on-board logic circuits. However, using touch screen control does mean the volume control knob has a genuine 104-step attenuator sitting behind it. Allocating most of the Reference 10’s control surfaces to a touchscreen does result in a very minimalist front panel, with just the aforementioned volume control, hard buttons for power and mute and an eye for the remote control. However, this positively bristles with more gadgets than a 1960s spy movie compared to the front panel of the power supply box, which has a LED and nothing more. There are a lot of valves in this preamplifier. More than most valve pre-power combinations, in fact. 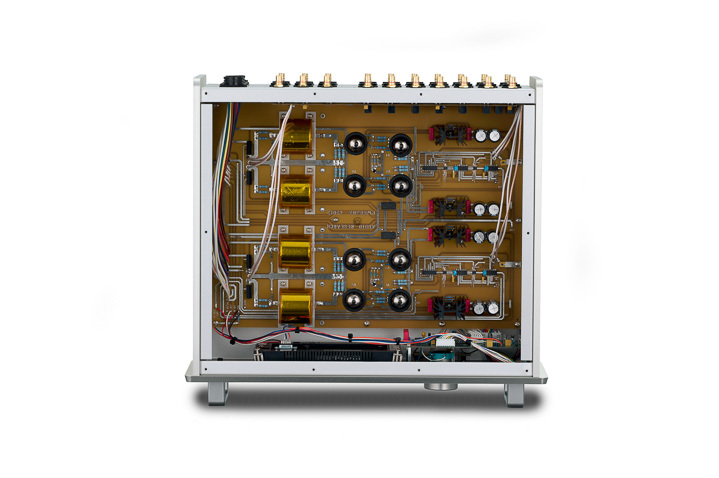 The eight 6H30P double-triode tubes in the line and gain stages are joined by two 6H30P and two 6550C valves in the power supply. That’s more or less like having a small mono power amplifier with valve rectification being used to drive a preamplifier. In preamp terms, that’s overkill’s big brother.